Dortmund/Nuremberg – Founded in 1868: at this year's BrauBeviale in Nuremberg KHS will be celebrating its 150th birthday, further emphasizing its innovative strength and standing as one of the leaders in its field worldwide with the longest experience. Both then and now, with its many years of expertise KHS has acted as a pioneer in beverage filling and packaging time and time again. At the trade show the Dortmund company will focus on the reliability of KHS machines and service products from their very beginning to the present day. The trade show takes its name from beer and brewing (“Brau” in German) which is where KHS has its roots. Both then and now brewers will find the perfect low, medium or high-performance system for their products at KHS, especially regarding durability and efficiency. KHS offers interesting further developments in its process technology, for instance, enabling considerable media savings to be made during beer stabilization and flash pasteurization. In the compact version of its powerful can filler KHS has an especially efficient filling system which scores top points with CO2 savings of up to 50%. The aim of all developments at KHS is to boost its customers’ competitiveness. “This doesn’t just mean greater performance and more service,” explains Becker. “Customers want flexible systems which give them fast format changeovers, grow with the success of the client and enable creative product design.” Lastly, it is important that operators of KHS systems can also continue to satisfy the growing demand of the consumer for sustainable and efficient packaging. 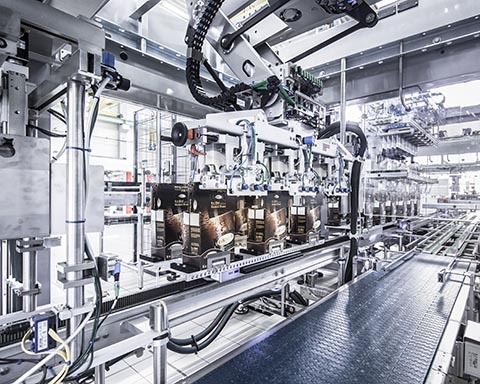 “Here, we’re setting standards with innovations such as the Nature MultiPack™ for cans, the constant development of ever lighter PET bottles and our diverse range of sophisticated block systems for filling and packaging and palletizing.” These include systems like the multifunctional, blocked packaging line developed together with Schubert, which by eliminating long conveying segments requires less maintenance, suffers less wear and consumes less energy. One machine which has been one of the best in its class since its conception over 40 years ago is about to enter the next generation: at BrauBeviale visitors will have the chance to see new KHS innovations for the future-proof production of PET bottles. With it KHS is making a considerable reduction in the carbon footprint left by the production process. The new developments will be presented for the first time by Kai Acker, the new chairman of the KHS Group Executive Management Board. The KHS Group will be on show in Hall 8 at BrauBeviale in Nuremberg from November 13 to 15, 2018. For more information go to: www.khs.com/presse.